Design Lab director Don Norman discusses the safety hazards of requiring humans to monitor self-driving cars—a proposal that has divided California lawmakers and tech companies. The article, by reporter Queenie Wong, has been reprinted in media outlets throughout the Bay Area. In a "Science Today" segment broadcast on Chicago's CBS radio affiliate, microbiologist and Qualcomm Institute faculty-affiliate Rob Knight discusses the interdisciplinarity of microbiome research. This segment from the University of California's science radio program, which is broadcast to CBS affiliates nationwide, includes an interview with Rob Knight about the new UC San Diego Microbiome and Microbial Sciences Initiative. Gary Robbins reports on a surprising finals week stress-reliever at the Jacobs School of Engineering: a Star Wars-themed robotics competition, led by Nate Delson and Mike Tolley. Equities.com republishes the San Diego Union-Tribune's overview of the relationship between UC San Diego and Qualcomm, which includes a discussion of the Qualcomm Institute. ""Only A Game"—NPR/ WBUR 90.9 FM (Boston)"
Warriors, Sixers: What Are The Odds? What's the statistical probability of the Golden State Warriors' record-breaking number of consecutive wins coinciding with the Philadelphia 76ers' record-breaking number of consecutive losses? Sports commentator Bill Littlefield speaks with QI affiliate Ron Graham to find out. 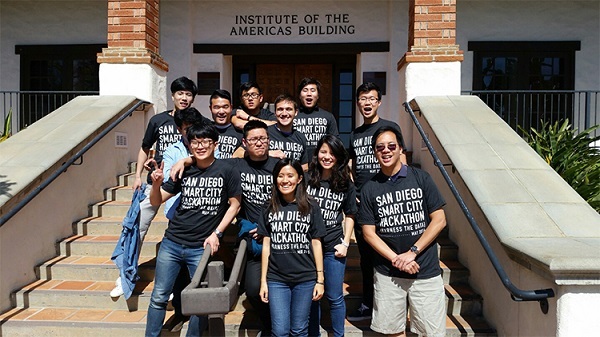 In this article discussing the relationship between UC San Diego and Qualcomm, reporter Mike Freeman describes the Qualcomm Institute's uniqueness: the company's funding of the institute provides QI's researchers with extraordinary academic freedom. National Geographic en Español shares a report by QI affiliate Dominique Rissolo on CISA3's work at Ecab, a remote archaeological site in Quintana Roo, Mexico that is home to one of the oldest churches in the Americas. The piece also includes a video fly-through of the site. Eric Wicklund reports on Qualcomm Institute affiliate Camille Nebeker's Connected and Open Research Ethics (CORE) project, which will establish ethical guidelines for research and IRBs working with digitally-collected health data. In a new segment of "Science Today," QI affiliate Rob Knight speaks with reporter Larissa Branin about his role at the center of the new UC San Diego Microbiome and Microbial Sciences Initiative. Gary Robbins reports on the election of nine San Diego scientists—including Qualcomm Institute affiliate Shu Chien—to the American Association for the Advancement of Science (AAAS). Chris Ross, a designer with the company MindFlow Design, offers a summary of the relationship between designers and entrepreneurs in San Diego, which he also shared with the audience at a Design Lab-organized event at the New Children's Museum. Tom Avril reports on the newest Franklin award recipients, given by the Franklin Institute for achievements in science, technology and industry. Among this year's honorees is Shu Chien, professor of bioengineering at UC San Diego and a Qualcomm Institute affiliate. "UC San Diego News Center"
QI affiliate Phil Papadapoulos is quoted in this article about the Open Science Grid's adoption of the Comet supercomputer for high-performance virtualized clusters. Papadopoulos is the chief technical officer at the San Diego Supercomputer Center, where Comet is housed. Gary Robbins reports on the awarding of the Franklin Award to QI affiliate Shu Chien—a highly prestigious award for science and innovation. Chien received the medal for mechanical engineering in recognition of his work on the physics of blood flow and on cardiovascular disease. Qualcomm Institute affiliate Rob Knight is quoted in this story about the declining diversity of the human microbiome—a state of affairs some microbiologists attribute to the fiber-poor diets Americans favor. John Carroll, a reporter for San Diego's local CW affiliate, interviews Design Lab Director Don Norman about the successes and challenges of researching self-driving cars. Reporter Gary Warth describes a recent visit by U.S. Reps. Scott Peters (D-CA, 52nd District) and Eric Swalwell (D-CA, 15th District) to the Qualcomm Institute, where the congressmen met with student entrepreneurs, held a town hall meeting and announced new legislation. Design Lab Director Don Norman and Bruce Tognazzini reveal some of the design shortcomings in Apple's iOS operating system, calling for a more functional and communicative approach that does not prioritize aesthetics over accessibility. Calit2 Director Larry Smarr and Qualcomm Institute faculty affiliate Rob Knight are quoted in this story about the upcoming Exponential Medicine conference, which addresses famed engineer Ray Kurzweil's claim that scientists will be able to eliminate most diseases by the 2030s. Futurism describes Qualcomm Institute affiliate Javier Movellano's use of a baby-imitating robot to discover when and why babies smile. With the help of the robot, Movellano's team discerned that babies time their smiles in order to maximize the smiles of those around them. Reporters from the CBS/University of California radio program "Science Today" speak with Qualcomm Institute affiliate Rob Knight about the American Gut Project, a crowd-funded and crowd-sourced project that will allow participants to see what their microbiome looks like. "10 News San Diego—10News at 6PM"
Reporters from San Diego's local ABC television affiliate describe a new study led by Qualcomm Institute affiliate Jacqueline Kerr: the Community of Mine study, which is recruiting participants from San Diego County to determine how neighborhoods influence residents' cancer risk. David Wagner profiles Qualcomm Institute affiliate Jacqueline Kerr's new "Community of Mine" study, which will collect data on how 700 San Diego residents' neighborhoods influence their cancer risk. Marcia Manna reports on the 16th Annual San Diego Asian Film Festival, the largest Asian film festival on the West Coast. Two events of the festival—a panel discussion and the Taiwan Film Showcase—were held at the Qualcomm Institute's Atkinson Hall auditorium. GeekWire reports on a new desktop supercomputer, the Pattern Computer, designed by a team of experts that included Calit2 Director Larry Smarr and QI affiliate Ken Kreutz-Delgado. It will be built at the QI's FiRe Lab and will connect to the Calit2-led Pacific Research Platform. SDBJ's Brad Graves reports on UC San Diego's newly launched Contextual Robotics Institute, which will support a broad array of robotics research that builds in part on previous work by QI affiliates. The piece also was republished by San Diego's local NBC affiliate, NBC News 7. San Diego's NBC affiliate shares the San Diego Business Journal's overview of the newly created Contextual Robotics Institute at UC San Diego, which will build on and connect with robotics research carried out by many Qualcomm Institute faculty affiliates. NSF Funds 'Big Data' Innovation Hub for the Western U.S. The San Diego Supercomputer Center's Jan Zverina discusses a new NSF program that will fund a 'Big Data' Innovation Hub for the Western United States, enabling academia, industry and government to collaborate on big data-centric research in a range of disciplines. Luis Monteagudo Jr. offers an preview of the 16th Annual San Diego Asian Film Festival, which features more than 130 cinematic works by filmmakers from 20 countries. The festival's Taiwan Film Showcase (Nov. 6-8) will be held at the Qualcomm Institute's Atkinson Hall auditorium.